Now that over four-fifths of the U.S. population resides in urban areas and farmers are rapidly aging, there’s no better time to start your own urban farm. You don’t have to be on a farm out in the country to have honey, chickens, fresh fruit, and fresh vegetables — and Old Manhattan Has Some Farms will happily provide the vivid imagery and soundtrack to help you out. Bright and bold gouache imagery illustrate this new take on Old MacDonald Had a Farm making this a favorite to look through for the sake of the artwork alone. Children from all walks of life are depicted in each scene helping adults as they compost, grow herbs, keep bees, farm on rooftops, and grow greens via hydroponics. It’s accessible and inspiring! It’s so much fun to hear my son sing E-I-E-I-Grow! He loves singing along with this book and seeing the children in each image inspires him to ask lots of questions. He’s asked if we can keep bees and when we’re going to start our own garden. He’s asked so many questions about if and when we can have our own garden that I’ve started taking him to Full Circle Farm in Sunnyvale, CA to volunteer. This is a great place where we’ve picked tomatoes, green beans, and done some weeding. I’m so excited to see a picture book like this! 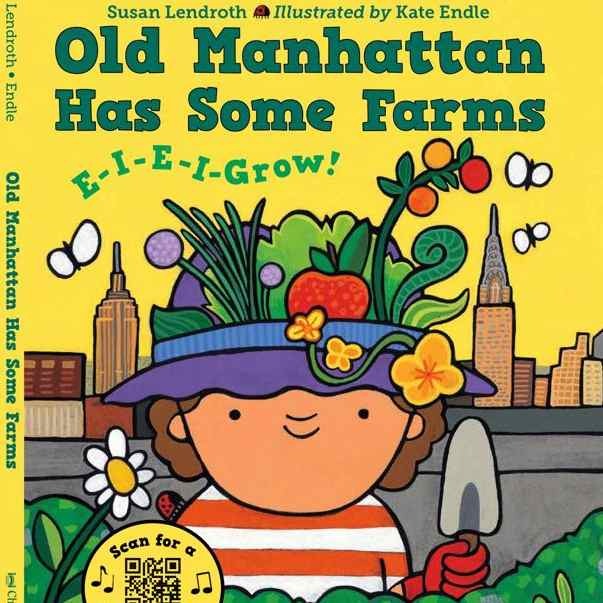 We read and sing Old Manhattan Has Some Farms regularly and each time I can’t help but think a little more about what we can do. Ages 1 – 7. Charlesbridge. August 2014. 32 pages. ISBN: 978-1580895729. Fiction. It’s a fun and easy way to introduce everyone to gardening on rooftops, community gardens, beekeeping, hydroponics, composting, and being a city farmer. Just as catchy and memorable to sing as Old MacDonald. Beautiful, bright illustrations that make worms, greens, and compost look dazzling and appealing to all. Each verse takes place in a different city with distinctive landmarks in the background. This is a great introduction to urban areas around the United States and Canada. After the song is a section discussing different aspects of urban farming, additional resources, and some suggestions on how to tweak the song to include different cities. Thank you so very much for linking to the interview with Susan Lendroth! Love your review and its readable style.